If you display a crosstab query as a datasheet, consider using a month's or day's number as a column heading instead of a text abbreviation (e.g., 1 instead of Jan or January, or 2 instead of Mon). Text abbreviations are sorted alphabetically. Apr appears before Feb, Mon appears before Sun, etc. Number representations will sort in their proper order. 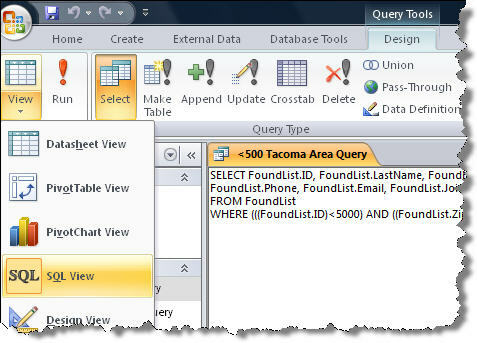 The ability to use dynamic criteria in a Query makes Access even more valuable. He has produced an Access Parameter Query Tutorial video that walks the viewer gently through the process. The site also has information on Excel and Word. Like [Enter Name] & "*"
The problem with this is that the query will return records that partially match the criteria. For instance, if users searching for records based on last name enter a parameter value of "Smith" they'll also get the records for Smithers, Smithfield and Smithson. Another problem is that the parameter query will ignore any records where the field being searched contains a Null value when you try to return the entire recordset with a blank parameter. To fix this, set up a query to limit responses to explicit parameter entries, but still allow users to return all records by leaving the parameter blank. If you're searching for LastName, open the query design grid and add LastName to it. Then, in the next blank column of the design grid, enter the same parameter (everything between and including the square brackets) in the Field text box. Finally, in the Or row, enter the criteria Is Null . If you're using any additional criteria for other fields, make sure to copy that criteria to the Or line as well. When designing a query, you'll often find the need to temporarily view fields beyond the ones you want shown in the final result. To do so, you probably drag the relevant fields to the design grid and then delete them when you're done. However, there's an easier way to view the data that you typically want excluded in the query. 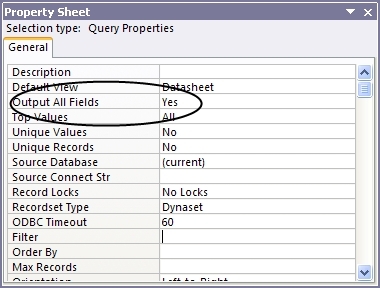 Data from all of the underlying tables' fields will be displayed in addition to the fields you specified in the QBE grid. 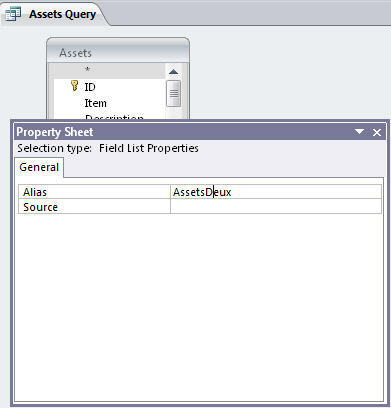 To change the query so that it only displays the fields explicitly selected in the QBE grid, simply reset the Output All Fields property to No.